With each mission, gliders are proving themselves to be one of the most innovative, adaptable and effective platforms for sampling the ocean. 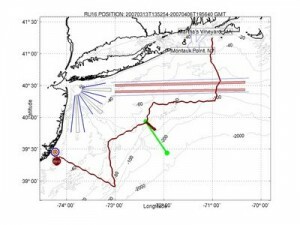 But unlike many of our other missions that tend to focus on small areas, this mission will take the glider from the coast of MA, to the continental shelf where it will zig-zag it’s way down to NJ, and finally swim into shore. This will be no easy feat, for there are numerous shipping lanes that cross the area, and we have already lost a few gliders to passing ships. But if the mission is successful, the glider will travel a distance of over 500km. Plus, this glider is carrying an onboard bio-optics package, to measure biological activity and sediment in the ocean, which will provide a huge amount of information on how biological productivity in the ocean might affect physical processes over such a large region. Along the way it will even meet up with a research ship, assisting in the study of Atlantic fisheries. The 100th glider mission continues to break ground, providing scientists a wealth of new data in one of the most interesting areas of the ocean, while demonstrating yet again that robotic gliders are capable of flying long distances in dangerous terrain, with just a little help from their pilots. The 100th Glider Mission is being flown by glider “RU16.” The data collected by RU16 during the deployment can be found in the Rutgers Glider Archive. Real-time data from the gliders can be found on the following page. 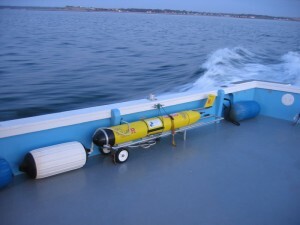 http://marine.rutgers.edu/cool/auvs/?page=deployments. You can select different “transects” (broken-up segments of data) using the pull-down bar. Note that the profile plots of data correspond to slices of the ocean underneath the line shown on the transect map starting from the green (start) circle and heading towards the red (stop) circle. RU16 has a traditional CTD package which measures conductivity (from which salinity is calculated), temperature and depth (calculated from the water pressure around the glider). Because of the importance of this mission, RU COOL scientists decided to start a blog, which details the technical challenges of the mission, along with scientific explanations of the cool results they are observing. We encourage you and your students to read along, and if you have questions about the data, scientific results, how the glider works or why the scientists are studying this area, please feel free to ask them by commenting on the blog. Why do scientists care about the temperature, currents or biological productivity of the ocean? Analyze the temperature plots, and convert the temperature scale to Fahrenheit if necessary. What is the difference in temperature and salinity from the water’s surface, to the bottom of the measured profile? Is this a large difference? Does this difference change at all in the horizontal direction? Compare the plots of temperature, salinity & density. Do you see any relationships between them? Is there any relationship between these factors and chlorophyll or optical backscatter? What might explain this? Look at several transects and observe where maximum chlorophyll values are? Close to shore or offshore? In a layer near the surface, middle or bottom of the water column? What factors might explain where this occurs? On the transect maps several blue and red lines are plotted. Identify what these lines are and determine why scientists have included them on their charts for this mission. In the first transect (3/17-3/18) there is a large gap of no data near the surface. Look at the transect map and determine why there is no data here. You can check your answer by reading the early entries on the blog. Take a look at the current Codar Surface Currents and locate the glider’s current position. 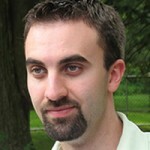 http://marine.rutgers.edu/cool/codar/real-time/archiveviewer_mab1day.php) The glider can travel ~50cm/s on it’s own. Are there any areas on the map in which the glider would would have trouble staying on course? If you go back in time, were there any times when at the glider’s current location it would have had trouble? By following along on the Mission Blog, you can find the answers to these questions and can learn about other interesting observations the glider is making. You and your students can also ask questions about features you see in the glider data, how scientists are controlling the glider, and why the information being collected by the glider is important to study. Here is a recent news article on the 100th Glider mission’s launch. For further background information and some cool diagrams on how the glider works, check out the following Star Ledger articles. Don’t forget the Mission Blog! I hope you enjoy interacting with the data and following along with the scientists as we continue this milestone journey. I would love to hear any feedback you have about the data, my activity ideas and what you and your students are interested in. And as always, if you have any questions please feel free to call or email me.